Just when you thought Christmas was over here in Italy, we now await the arrival of the Befana. When I was living in the UK, all of the decorations and Christmas tree would be down by now and the festivities would be truly over. Here in Italy Christmas ends after the arrival of the Befana on the eve of Epiphany ( January 5th), and in fact as you travel around you can see that many of the shops are still closed and those that are open are still playing Festive Music! The story goes that an old lady (La Befana) was asked to go with the three kings to Bethlehem but refused, she later changed her mind and decided to try and find baby Jesus. She rode on a broomstick and delivered toys to children on route. The story goes that she gives coal to naughty kids and presents to those that have been good. I’ve always been confused as what sort of gifts to buy and how much to spend, especially after the outlay at Christmas. I’ve spoken to many Italians in the area who have informed me it’s best to buy some sweets in a stocking and a small gift, in fact most sweet shops sell black confectionery that looks like coal. 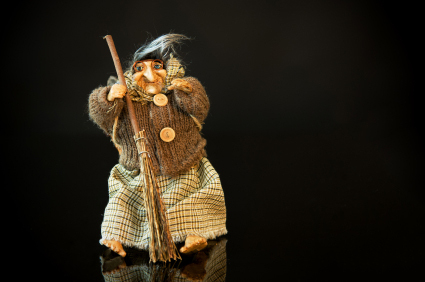 La Befana is depicted as a witch but not necessarily an evil one and of course most toy shops sell a version of her. I must admit that it’s taken a little while to fully get into this extended form of Christmas but now I truly love it, especially as I prepare the gifts etc for my small son. This entry was posted in Piedmont region and tagged Epiphany, La befana on Saturday January 5th, 2013 by Clive Wisbey.